The Adventure Retreat is perfectly placed camp in Nainital, in the lap of nature and away from hustle bustle from city life. 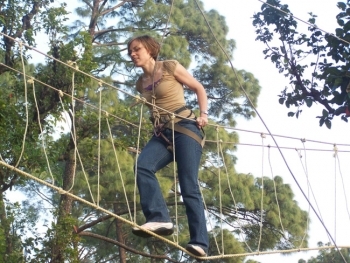 The Adventure Retreat overlooks 4 towns & a beautiful and large lake. The camp location is surrounded by hills abd is abound with beautiful flora and fauna, offering ample opportunities to Naturalists, Trekkers, Painters and Bird watchers to try out their favourite adventure activity here. 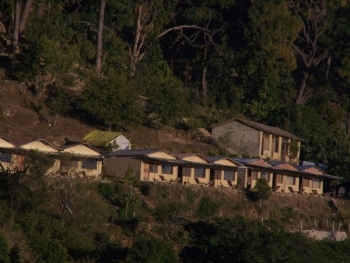 The Camp is situated near Mangoli 17 Km before Nainital on Kaladhungi Nainital road.The Adventure Retreat is located at an altitude of approx 5000 feet above sea level in the Nainital district of Kumaon region of Uttarakhand. The resort provides accomodations for adventure and nature lovers amidst of the calm and peaceful terrain that still remain untouched of the civilisation. The accomodation are provided in all weather tents and camps to guests in keeping with the mood of the surround. A separate dinning place is organised in keeping with the theme of camp and wild. - Fully furnished, spacious, carpeted, fully furnished 10x10 double bedded swiss tent, clean hygienic linen and polyfill quilts, attached bathroomwith, western style toilets with hot and cold running water. - International Climbing equipment, experienced mountain guiders., dedicated staff, pick and drop facility, accommodation for driver also available, etc. Four Activity with lunch Rs 650 - Lunch veg all meal will be served Buffet type. - Any Transport, Expenses of personal Nature. - Driver meal also available @ RS. 150/- Meal fix veg . Mangoli is can be reached from Delhi (322 Kms), Dehradun (310 Kms), Haldwani (48 Kms), Nainital (17 Kms) and other major towns of the state and region by buses and taxies from major towns of Kumaon region heading for Nainital. Nearest airport is at Pantnagar which is 72 Kms from Mangoli . From here, either board a taxi or bus for Nainital and reach Mangoli . Nearest railway station is at Kathgodam which is 42 Kms from Mangol.